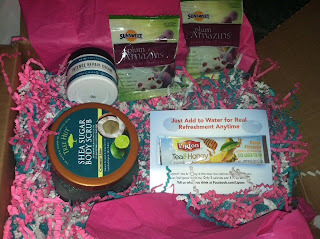 If you saw my pictures for the Summer Beauty Box, I know you will be as excited as I am for the Fall Beauty Box!!!! On sale July 24th. The last box was $39.99 with $10 shipping and was worth TONS more than that!!! 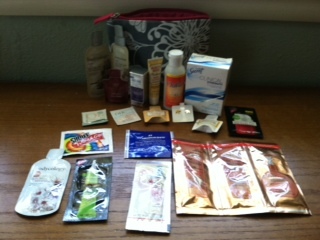 This week's giveaway: Sample Bag!!!!! 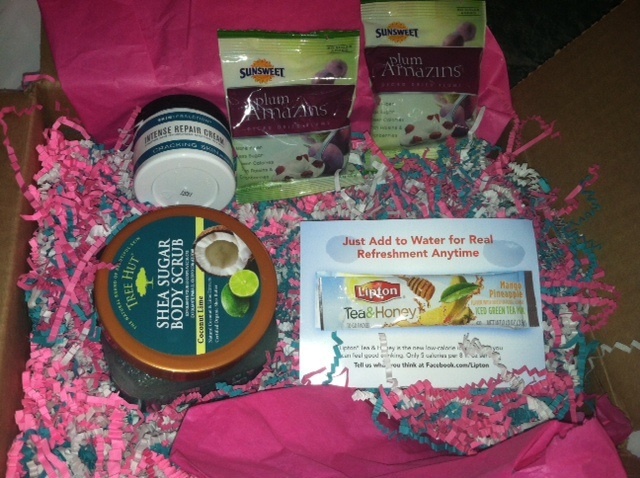 For those that got the June Citrus Lane box, you are probably wondering what to spend your $35 gift card on! BEFORE you spend it, here are some ways to save!!! What a great deal. Even if you did not participate in the last Citrus Lane box, you can still do all of the above and find something really wonderful with the $25!!! So, there is a product review site out there that not many people know about. If you have a child or baby in the house, or you are expecting one, you NEED to become a member of Tried and Truth. I have gotten $172.98 in products JUST for doing some video reviews of the products I LOVE, or LOVE TO HATE. Want to start reviewing too? Follow this link: http://www.triedandtruth.com/?ref=116 and sign up for yourself! Submit your first review of baby gear you own along with a short <1 minute video review (we love Videolicious, a free app for iphone). Then email the link to your review to lisa@triedandtruth.com. We'll send the first 20 parents to do so a $5 Starbucks Gift Card! If you're a Tried And Truth veteran, forward this to some parents you know and maybe they'll share some of the Black Gold with you. Are you at home with the kids all summer and ALREADY running out of things to do? There is this wonderful new website called Reading Eggs that I recently was given a free trial to for giving a review of the website. Reading Eggs is an Online Learn to Read Program, and was perfect for both my 5 year old. He found the website entertaining and tons of fun! No credit card is required to start the free trial! Mr Clean Bliss Premium Latex Free Gloves. These are not available on Amazon, but could be found online for $4. Spray Away Glass Cleaner. Amazon price is $51.99 for a pack of 24. Although buying a case my be completely impractical, that does give a rough guess at a price of $2.16. Barkeeper's Friend. Amazon price of $6.91. That makes the value of this price: $20.05. 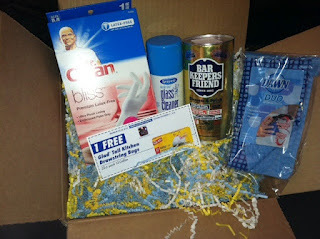 I love the coupon, and was in great need of trash bags and new cleaning gloves. Overall, I love the box because I can see myself using every single item! 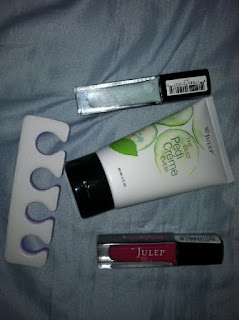 So, I decided to try out Julep because it was only 1 cent. For a penny, I will try almost anything!!!! I received my box, and it was exactly what showed in the picture. I CHOSE the colors I wanted, which I LOVE about Julep. Each month they send out a box, but you can CHOOSE your colors from several different options. The colors in person, and on my nails were AMAZING! The bluish green was simply gorgeous! I just love it! I have started using the Pedicure cream too, so hopefully it will work wonders. It is hard to put a real "value" on everything, because the brand is Julep, and there are very few places to purchase Julep. Amazon does sell it via Sephora, who values each polish at $14.00. So, the value of the box is maybe at about $35 (the cream is only available on the website as well). The AMAZING thing, is that I only paid 1 penny, and so it was really not much of a risk. Even with the box costing $20, it is a good value, especially if you like nail polish! You can sign up at www.julep.com and use the code COLOR2012 to get the intro box for 1 penny. I cancelled my subscription with them simply because I have TONS of nail polish, and it did not apply well to my nails. However, it worked well with my daughter's nails, so you may have a different experience! Wow! Just when you think they cannot get any better, they send an amazing box yet again!!! This month was all about art! My little ones have been having such a fun time with everything in the box, and you will see from my picture that some things only made it a short time out of the box. 2 packets of Eco-kids finger paint. amazon sells 5 for $22.69. Approximate value is $9.07. These are really nice because you mix them yourself and can make a very small amount at a time. Putumayo Kids CD Sampler. This is only available from their own website. They charge $29.96 for the CD. What is nice is you get to hear songs from each of the CDs they have. I would value it at $5-10. If that was not enough, they once again sent a GIFT CARD. This time $35 (!!!!!!) to Minted.com Unlike the other gift cards, your gift card does not cover shipping. My shipping was only $3.95, so very reasonable! If you are already a Citrus Lane member, and have not used your gift card yet, follow this link: http://www.minted.com/referral/landing/8d7pbz and sign up for minted.com, and you will get an additional $25 off!!! If you are not yet a Citrus Lane member, it is a monthly subscription service that is $25 a month. They base YOUR box on your child's age and gender, and goes up until age 3! Right now, I believe there are two active codes. You can save $25 on a six month subscription by following this link: http://www.citruslane.com/invitedby/Jonna.Ziniel and using the code JAMNOW This was supposed to expire 6/14, but many have reported it is still working. If you want just one month or the JAMNOW shows as expired, follow the same link http://www.citruslane.com/invitedby/Jonna.Ziniel and use code SPRINGFUN for 10% off. Well, I just joined yet another monthly box, and this one looks really good! It is called Julep, and for $19.99 a month, you get a box with nail polish and other related products each month. You receive at least 2 polishes, which they claim is a value of $40. 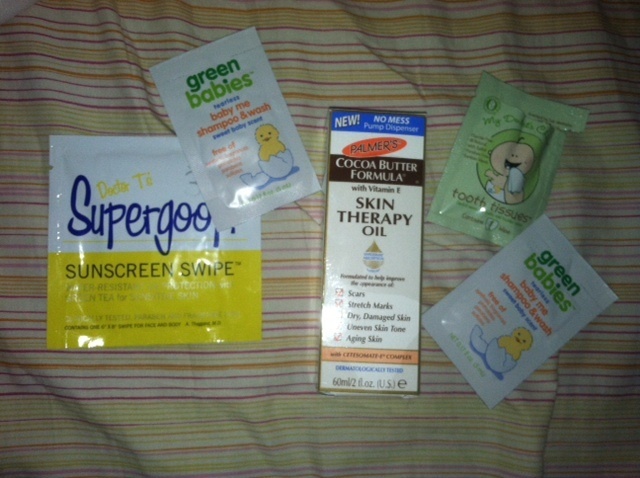 Other products have included hand lotion, toe separaters, etc. Right now you can get a monthly box for ONE PENNY! Yep, I just verified, ordered mine and was only charged ONE CENT! Awesome! I cannot wait for mine to arrive. Not only that, but each month you can CHOOSE which colors you prefer. They give you a "type" or maven you are, and if you do not like the colors in your box that month, you can look at the other colors and choose a different box. You can always cancel as well (no obligation), so could cancel right after your first box! For one cent, I will try it out! And use coupon code: COLOR2012 This should being your total to one cent!!! I will post my first box when it arrives! I have to stick around for at least one more month . . . HOPING that it will be better than last month! $10 a month . . . So, I joined MyGlam last month. I had been on the waiting list for a little while, so I was willing to give it a shot for $10. Wow! I am glad I did! This is another subscription service. You pay $10 once a month, and get a bag of samples. It looks like each month they come in a cosmetic bag, and this month's was a cute gold sparkle bag. I think it could easily double as a small clutch! Philosophy Take a Deep Breath sample, .4 oz: Amazon prices this at $17.00 an ounce, making the sample worth $6.80. It is a rather small sample, but I love all things Philosophy. AND you get this cute little bag (much more useable than a box!). When you compare this to Birchbox, which is the same price, what a difference! MyGlam wins! The approximate value of the bag is $39.54 (based on the prices above). Not only that, but I will USE each and every item! I love the color of the lipstick, and I think it is a good match for my skin tone! I love my first MyGlam bag, and I hope next month is just as good! So, I really thought you could not get worse than Bluum. Last month, Birchbox was SO good, this month was a COMPLETE fail. I am very upset with them, and am really thinking of cancelling. I feel like they are dishonest in what they promise will be in boxes, and completely misleading. You will notice that a LOT of the Birchboxes out there for this month had full sized products. Not only did I NOT get a single full sized product, but I also got 3 products that are complete junk-- make that 4 products. What's in the box?? Comodynes Self Tanning Wipes. $2 each on Amazon. Worth $4. The problem is, I have VERY light skin and they sent me an "intense" color, so basically this is trash to me. A tili bag. Before you get all excited, this is a cheap zip-loc bag. They are priced on their own website at about $1 each. And a note to all other Birchbox folks. The info says this can be used as a carry on for liquids. IT CANNOT because, well, it is not CLEAR!!! FAIL, Birchbox, FAIL! Oh, and how could I forget the MEN'S SAMPLE they sent. That is RIGHT, they sent me a MEN'S sample. I have junk to get rid of too Birchbox, please do not send me your junk you have no other use for. Birchbox FAIL. It anyone is wondering, it is a little perfume sample. Yes, like the ones they try to attack you with at the department store. All in all, you could add these up and the total is $12. Because I cannot use the wipes, it is worth $8 to me. $8 for a bunch of junk that will probably be thrown out once it all expires. At this point, I am giving them one more month. I liked my full sized product from last month, so MAYBE they will be ok next month. This month was a waste of my money, and I would not suggest or recommend Birchbox. UPDATE!!!! I DID CONTACT BIRCHBOX AND WAS TOLD I WAS MISSING A FULL SIZED BRONZER, BUT THEY WERE OUT. THEY CREDITED MY ACCOUNT WITH $10 WHICH IS WHAT THE MONTHLY SUBSCRIPTION COSTS! AMAZING CUSTOMER SERVICE, AND GETTING THAT ONE ITEM WOULD HAVE MADE MY BOX VERY WELL WORTH IT!!!! I first attempted to get a Cravebox when they first introduced them, and was not one of the selected few that was able to get a subscription. Last month, they had a lottery for more open spots, and I was lucky enough to win a "spot." That does not mean it was FREE! :) Cravebox is $10 a month, so it is one of the cheaper subscription boxes out there. Right now, you can sign up to be informed when the box is available again, but not to get an actual subscription. pack of 6 Guylian Truffles-- not listed on a website in sizes this small, so price hard to determine. Many people received these melted, but mine came intact. Other people complained about a bad taste, but mine were DELICIOUS! Total value was well over the $10.00! I thought everything was wonderful and appropriate for summer. IF you can get in, I strongly recommend cravebox! This is my last month of Bluum, and boy am I glad!!! The month of May was about as good as any other month with Bluum-- although I did not get yet MORE Wedela samples! I apologize because the Applesauce that was included in the box was immediately devoured by my 1 year old, so it did not make the picture! Ella's Kitchen Applesauce Food Pouch-- Amazon Price: $1.85 My daughter did seem to enjoy it! My Dentist's Choice Tooth Tissues-- 1 Wipe-- Yes, you read that right-- they included 1 wipe. Amazon values this at----24 cents. I did use it on my daughter and she HATED them. The taste must have been rather unpleasant. 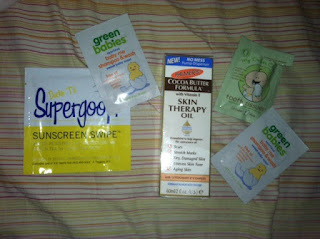 SuperGoop Sunscreen Wipe-- 1 Wipe--Yes, again, 1 wipe. Amazon values these at 85 cents a wipe. Green Babies Tearless Baby Me Shampoo and Wash- .17 oz-- Amazon values it at (based on a per ounce value) at 28 cents. They did include 2 (I think on accident), so this would be valued at 56 cents. When we add all of this up, the TOTAL is $6.44 and that is fairly generous. Bluum boxes are 12.00/ month (a fact you will not find on their website unless you subscribe), so this is, without a DOUBT NOT worth it! They seem to spend more time on their boxes and packaging than in the contents.